The award winning point-and-click comedy adventure following Detective McQueen and his partner, Officer Dooley, is finally going to continue! 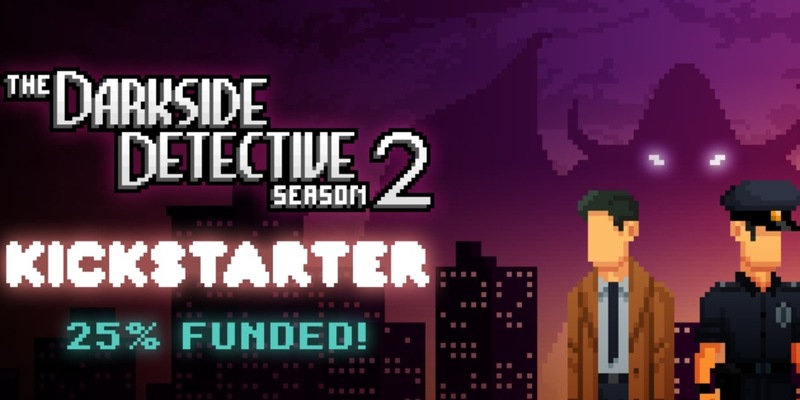 Not only has the original Darkside Detective game received updates for new adventures, without being included as DLC, but fans of the game can now officially look forward to it becoming a series as Spooky Doorway announces Darkside Detective Season 2. They did put the game up on Kickstarter to initiate the funding to get this project completed, but within the first 24 hours they have reached 30% of their goal! That’s 5% more than what they had when they decided to make the banner (used above). This game is pretty much guaranteed to happen and even those who are yet to be fans can see why from their announcement trailer. The new areas shown are sure to be full of spooky and comical moments. A circus, a castle, and plenty that we have yet to see. I have to say though, that giant demon hovering over the city at the end, and in the screenshot, is quite intimidating though. There was quite the finale at the end of the first game, so it looks like Spooky Doorway is looking to out-do themselves in the next season. Are you excited for the next season of this comedy point-and-click adventure?